It is to Tran Vy that my family owes much of the research and integration of the first elements constituting the Tran "Gia Pha". Over 2000 years ago, imperial edicts in Vietnam required that local administrators establish family registries in which they recorded all names, marriages, births and deaths within a family. Known as gia pha (family history), such registries have their origin in ancient China and are found elsewhere in Asia, including Japan. [..] Family registries are more common in the northern and central parts of the country. After the death of his two older brothers, Don Tinh Tran Than (1699 - 1758) and Nguyen Luan Tran Tiem (1703 - 1751) together with their descendants, Man Truc became the head of the family. He became responsible for ensuring the continuation of the family lineage and for presiding over the ancestral cult. Man Truc was actually only a three months old foetus when his father, Tran Ton died of cholera in 1714. He lived with his mother until the age of 8 until one of his paternal uncles adopted him and sent him to school. He was such a poor student that even his older brother took note of his poor aptitude for studies. I find this last note interesting considering it betrays the relative importance that the Tran family placed on education and intellectual prowess. It also implies that Man Truc along with his brothers were expected to fill their father's shoes and become equally apt scholars. Would Man Truc succeed in overcoming his initial childhood lapses to fulfill family expectations? Read on. Man Truc did what many people do to escape self-fulfilling prophecies. He changed his environment, away from negative pressure. At 17 years old, he decided to leave his family and go far away...by way of the ocean to the south of the Dai-Viet, in Gia-Dinh (Saigon). In Gia-Dinh, Man Truc began a commercial enterprise. After saving enough capital, he invested in the construction of junks which in turn, were critical to the operation of his commercial activities. I assume, based on what is to follow in this fairy tale account, that like his great uncle, Tran Hong, Man Truc was also well versed in traditional medicine. I also assume that at this stage, he took the name Tran Vy. This is the name that the account uses from now on. Keen to protect himself and his business against any bad omens, Tran Vy tried all he could to persuade the bird to fly off. But all his efforts were futile: the bird remained perched obstinately on the junk. It would not budge. So our ancestor decided to lead a small enquiry and soon discovered that the bird in question belonged to an old woman. This woman suffered from a affliction that none of the doctors she had consulted so far, had been able to treat. In time, she had learnt that the junk owner, Tran Vy enjoyed a certain reputation as a healer. And so she had found no better means to attract his attention than to send her crow. This was how the dark bird had come to perch itself on one of Tran Vy's junks. Her stratagem succeeded. Tran Vy was soon persuaded to visit the old woman and to administer a medical treatment. The medication that he prescribed turned out so efficient that the old lady soon regained her health. To thank him for his attentive care, she gave her daughter, Trinh Thuan Cung Nhan, in marriage. In the course of his life, Tran Vy shared his life with four women comprising two wives and two concubines. His first wife, Trinh Thuan Cung Nhan (1719 - 1757) who he married in Gia Dinh, gave him 9 children including 7 boys and 2 girls. His second wife, Duong Thi Nhu-Nhan (1737 - 1770) produced 4 children including 2 boys and 2 girls. His first concubine, Thi Nho-Nhuan (1743 - 1801) produced 5 children including 3 boys and 2 girls. And finally, his second concubine, Le Thi Nhu, gave birth to 1 boy. I suppose that Tran Vy must have been very wealthy in order to be able to afford this many women. I wonder whether the high male count among Tran Vy's children was natural or if it was brought upon by female infanticide or foeticide as a result of the preference for male heirs in this family's patriarchal culture. This I will never know. 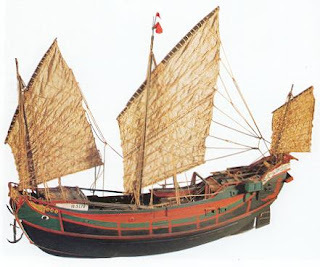 At 26, some time after marrying his first wife and having already had several children, the successful merchant Tran Vy, confident in the sense that he had now fulfilled, if not surpassed, family expectations and perhaps longing to regain his roots, finally returned home to his natal village. Tran Vy lived until the old age of 80. Much of his spare time was employed in the research and compilation of the Tran Gia Pha. "Trung-Thuan Dai Phu Han-Lam-Vien Thi-Doc Hoc-Sy"
"Thanh Tu Phan Cung Nhan"
1Huu Ngoc, As the Crow Flies, So Does its Meaning, Vietnam News - The National English Language Daily, Jul 2004.